When I saw these popsicle stick bracelets from Craft Affection I knew they were the perfect project for my fashion conscious 3 year old. I also love any project where we already have all the materials at our house. To make these cuff bracelets you begin by taking popsicle sticks (we had these fun colored ones) and soak them in water for a few hours. After soaking, the popsicle sticks can bend without breaking. 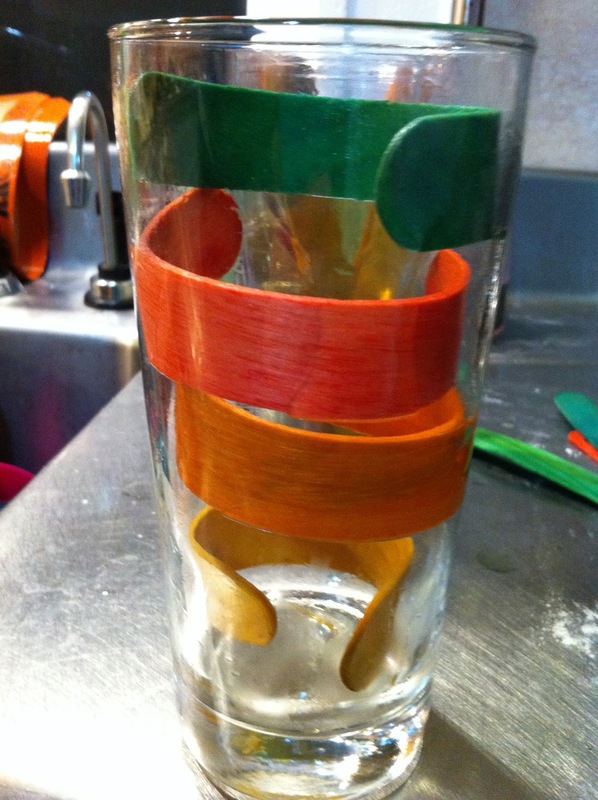 Carefully curve the popsicle sticks into a cup and let them dry. We left ours to dry overnight. Once they are dry you can easily pull them out of the cup and they will maintain their curved shape. Since our popsicle sticks already had a color (although the color did run a little in the water) we just glued buttons, beads and cut paper right onto the Popsicle stick. For the cut papers The Bee used some paper punchers we have to punch shapes out of patterned paper, which we glued onto the bracelets. I then put a coat of Modge Podge right onto the bracelets just to seal them a little. They were super easy to make, look great and would be fun gift! NFW. This is SO COOL! AH! Love this! I'm thinking about trying it for myself and just using silver paint and some hotfix bling. Thanks for the idea! OMGOSH i totes love its trendy and inexpensive hip! Silver paint black fake jewels i will so wow!!! thx a ton!! I tried this soaked the sticks and they cracked. So tried again and soaked overnight and still cracked so I tried again soaked them for 4 days and still they cracked.... They were bendable but not enough to put in a cup.